“During my trek in Nepal I often though about Pam and felt I was seeing and experiencing all she had missed. And now, (at home in the U.K.) as I am typing this email I am thinking how glad I am that the radar is installed (in TIA) and that means other people will not die and their loved ones will not go through what we did.” Karen McCarthy, February 2018. Note from the Author: This article was written prior to the crash of U.S.-Bangla Airlines on March 12, 2018. Deep condolences to all those involved. At 2.30 p.m. on Monday September 28, 1992, Pakistan Airlines Flight PK268 from Karachi International Airport crashed on approach to Kathmandu, 18 km south of the city, at an altitude of 2,225 meters. There were 167 on board, including 12 crew members. No one survived. The exact cause is not known, as there is no record of the flight crew’s conversation, but it was suggested that evidence indicated the prime cause of the accident was “one or both pilots consistently failed to follow the approach procedure and inadvertently adopted a profile which, at each DME fix, was one altitude step ahead and below the correct procedure. …Contributory causal factors were thought to be the inevitable complexity of the approach and the associated approach chart." In other words, at each DME (distance measuring equipment) fix, it appears the plane was ahead and below where it should have been. The DME is defined as a navigation beacon, which enables aircraft to measure their position relative to the beacon. For whatever reason, after being instructed to maintain 11,500 feet, the aircraft descended incorrectly to the altitude of 8,200 feet (2,400 m) and impacted into a steep cloud-covered hill. When the investigation gave its findings, one (among many) of its recommendations was that the Nepal Government and Department of Civil Aviation should “study the practicalities of providing an instrument landing system (ILS) and radar coverage at Kathmandu.” Another finding was that working conditions be improved for air traffic controllers, including providing training and formal air traffic controller licenses. This disaster came hard on the heels of the crash of Thai Airways 311, 37 km north of Kathmandu, on July 31 of the same year. All 113 people on board lost their lives. There, too, one of the probable causes was sighted by the investigators as "ineffective radio communication between the area-control center controller and the flight crew, which allowed the aircraft to continue in the wrong direction." Two years later, in 1994, rating and licensing of air traffic controllers was introduced, but it was only in 1998 that an ASR/SSR radar system was inaugurated, funded by the Government of Japan. Almost 20 years on, that radar system became obsolete and in desperate need of being replaced or upgraded. For the second time, the Government of Japan stepped in, and through their development arm—the Japan International Cooperation Agency (JICA)— gave over 9 million dollars to the Government of Nepal to install an antenna tower and monopluse secondary surveillance radar (MSSR) system at Bhattedanda (the highest point in the valley and crash site of PIA PK268) and a new antenna system at the airport itself. The goal behind this is to both improve air safety in Nepal and strengthen air transport capacity to vitalize the national economy. These are the facts, but of course, there is always a human face to any disaster, as I was about to find out. Among the passengers of PIA 268 was Pam Muttram, a young woman of 34 who was a women’s health worker in north Manchester, U.K. Pam was founder and co-developer of the Y-WAIT Young Women’s Health Project that reached out to young women. On this particular trip, Pam was traveling to go trekking with a group of climbers from the north west of England who were planning a future expedition, and the trek they organized was part of their expedition fund raising. Just before leaving for her trip, Pam handed her friend, Karen McCarthy, a sealed envelope with instructions only to open the letter it if she didn’t return from Nepal. Naturally, Pam fully expected to return. Certainly, Karen did not expect to hear—on her drive home from work—that PIA 268 to Kathmandu had crashed. On opening the letter that Pam had given her just a few days earlier, Karen read, “If you are reading this, I did not make it back…” This note from beyond the grave impacted on Karen profoundly. It was effectively Pam’s will, and also contained her parent’s phone number, who had no way to get in touch with Pam’s friends until Karen called them. Pam’s mother herself had heard on the 12 noon news, long before the airline contacted them. As Pam had a big impact on people who met her, both friends and colleagues, they were all understandably profoundly shocked by news of her death. These feelings were exacerbated by the amount of TV coverage about the crash. Footage of the crash site was shown on the news, and Karen spoke about the shock of seeing a man sifting through debris and holding up an open passport to the camera, which was Pam’s. So on October 24, 2017, Karen flew from Manchester to Kathmandu. The tears pouring down her face as the plane approached Kathmandu were tears of sadness in memory of Pam, and also, understandably, tears of fear as she made the same approach as Pam would have all those years ago. What Karen perhaps didn’t realize was that, in October 2017, the approach to Kathmandu remained as tricky and dangerous as on that fateful day in September 1992. I met Karen through a mutual friend living in Kathmandu, and we attended a few events together, but it was only after Karen had trekked the Annapurnas and taken a trip to Tibet that I learned about Pam and about Karen’s intention to visit the memorial that PIA had erected below the crash site in memory of flight PK268. Two or three days before leaving Nepal, Karen told me she finally had the courage to visit the memorial at Lele. I had never been there, so thought it would be both an interesting morning out and moral support for Karen if I went along. Despite being only around 14 km from the ring road, Lele lies in rough terrain, so a four-wheel jeep was hired for the trip. It took around an hour to reach there, and around 1.5 hours to return through the heavier late morning traffic. And, although the driver did stop at one ‘view point’, no mountains were to be seen through the fog and cloud. Very much, no doubt, how it was on September 28, 1992. 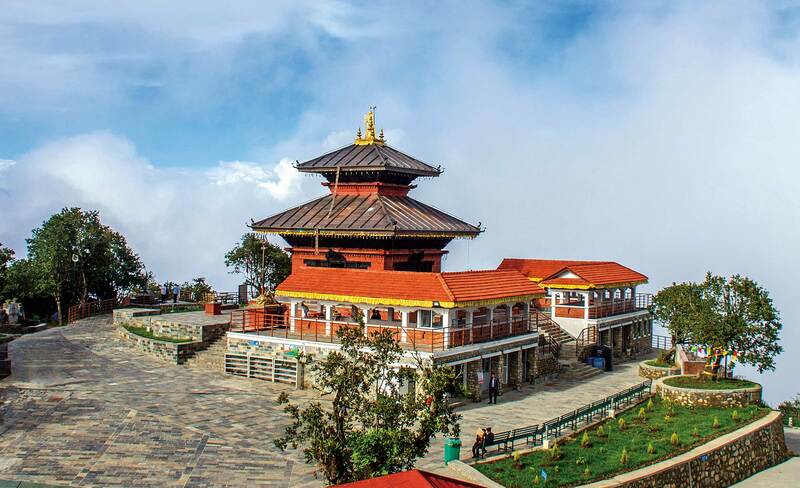 Lele village lies at the foot of Bhattedanda, the highest point in the valley, and to reach the memorial site you need to walk a few minutes from the parking area. Paved stones and an archway mark the entrance. On climbing up the steps, the path opens out to a horseshoe shape, where each passenger on the flight has their name carved into stone. The carvings are touchingly grouped by nationality, including the Pakistani crew members. It is obvious the caretaker takes his or her job very seriously, as the area is spotlessly clean. Moreover, around the British passengers’ section, there are copper water jugs filled with fresh flowers. In the center of the stones is a grassy area, which contains a tall pole with the words, “May Peace Prevail on Earth”, painted onto it. I leave Karen to light her candles and incense and be with her own thoughts. Some time later, Karen walks down the steps to where I am sitting in the sun, listening to the birds. She had decided not to climb up the hill to the actual crash site. We drink cold coffee and snack on muesli bars and Christmas cake. I half joke that maybe we should have put some rum in the coffee. But the tension, so very obvious in the drive to Lele, seems to have left Karen. Almost simultaneous to this trip, I learn that the Japanese Government, through JICA, installed a new radar, officially commencing its job on February 1, 2018. Somehow, it seems both ironic and fitting that the same month efforts were finally completed to make the approach to Tribhuvan International Airport safer, Karen made a pilgrimage to honor the memory of her good friend Pam Muttram.